Sprint car & midget driver Rico Abreu joined the Racin Nation crew on Saturday, June 14, 2014 to talk about competing in USAC’s “Indiana Midget Week”. 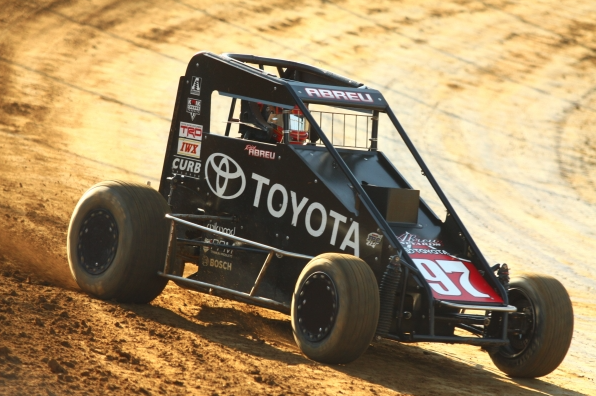 Abreu went on to victory in the race at Lawrenceburg that night and two days later, he won the “Indiana Midget Week” championship for the 10th time in his career after 4 straight podium finishes. Listen to the segment to hear what he had to say on Saturday about coming back from injury, Indiana Midget Week excitement, and landing at the top of National Speed Sport News’ Power Rankings. This interview was live on the Racin Nation show on NBC’S Florida Sports Talk Radio, and the audio to the interview was originally posted on Florida Sports Talk’s website. Tune in to 100.1FM, 900AM, or 1230AM every Saturday at 9am to hear more driver interviews like this.